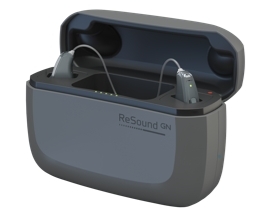 GN Hearing today unveils the world’s first Premium-Plus hearing aid: ReSound LiNX Quattro™, designed for people who want the very best that technology has to offer and desire a brilliant sound experience with great speech intelligibility even in noisy situations. With a new chip platform, a completely rewritten sound processing package, a redesigned wireless radio with extra signal strength and a unique utilization of microphones, sounds are passed to the amplifier without being altered. The result is a brilliant experience with Layers of Sound™ that is designed to inspire confidence in people with hearing loss, so they can enjoy the moments that matter most. Compared to ReSound LiNX 3D™, the new chip enables 100% faster processing, 100% additional memory, 35% increase in frequency bandwidth, and the highest input dynamic range in the industry. ReSound LiNX Quattro™ introduces a new category of Premium-Plus hearing solution for people who, in social and professional settings, desire great speech intelligibility even in noisy situations and demand a brilliant sound experience with access to Layers of Sound™. While the primary goal of hearing aids is to hear and communicate with others, the hearing aid’s ability to faithfully reproduce music is the ultimate test of sound quality: 95% of users prefer ReSound LiNX Quattro™ for music listening compared to other premium hearing aids (Jespersen et al., 2018). With its 6th generation of 2.4 GHz wireless connectivity, GN Hearing further expands its technology leadership within connectivity. ReSound LiNX Quattro™ is the only solution to offer direct full streaming to smartphones. ReSound LiNX Quattro™ is the smallest and longest lasting 2.4 GHz integrated Li-ion rechargeable hearing aid on the market. It comes with a compact portable charger that holds three extra charges and offers quick charge. With 25% less power consumption when streaming, ReSound LiNX Quattro™ is the only hearing aid that offers 24 hours of use even when streaming 50% of the time and 30 hours of use on a fully charged battery without streaming. In addition to unparalleled sound quality and rechargeable technology, ReSound LiNX Quattro™ features GN Hearing’s unique remote fine-tuning capabilities. GN Hearing continues to be the pioneer in the development of remote fine-tuning for hearing aids, which features unique, cloud-based technology. ReSound Assist™ connects hearing aid users with their hearing care professionals via the ReSound Smart 3D™ app, allowing remote adjustment of their hearing aids based on individual needs and preferences leading to even better sound quality. “ReSound LiNX Quattro™ is designed for people who want the best of the best and want a brilliant sound experience with great speech intelligibility even in noisy situations. The combination of unprecedented sound quality with Layers of Sound™ and the longest rechargeable battery life available puts ReSound LiNX Quattro™ in a league of its own, transforming the hearing experience for people around the world”, says Anders Hedegaard, CEO, GN Hearing. ReSound LiNX Quattro™, and Beltone Amaze™, will be rolled out starting end of August 2018. The hearing aid will be launched in the RIE (Receiver in the Ear) form factor, with both a rechargeable and replaceable battery solution, and will be offered in a new Premium-Plus price point only. The ReSound LiNX 3D™ product family, which was first launched in May 2017, continues to be available as a premium choice, with excellent sound quality, efficient and convenient fitting as well as groundbreaking remote fine-tuning. ReSound LiNX 3D™ is available in virtually all major countries and will be launched in China later in 2018. For further information, please visit gn.com and resound.com/quattro.